Did my homework looking for professionals for my dock to be removed/replaced with robust materials and design. Found Dock Connection and talked to Ron Walters and let him know my financial position and timeline for when I needed it to be completed. He visited me and spoke of the new life-long type of materials (plastic coated, pressure treated pilings, non-wood decking by Wolf etc.) They showed up to remove the old dock, disposed of every splinter, installed the new dock, made some upgrades, all on time and beyond our expectations. I'm a real stickler so I crawled around the dock, looking over everything closely, and it had huge bolts for the piling and beam mounting, big beams, and beyond what I would have expected. Kept the target price the same, and I couldn't be happier. Thanks Dock Connection! 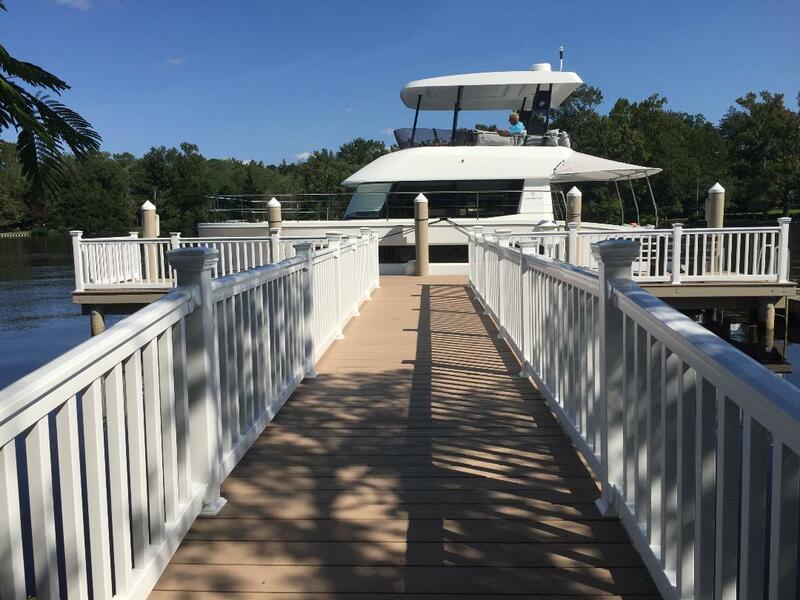 We're New Jersey's Premier dock company. We'll post photos and description of our latest work here.